Pharaoh Rebirth takes the idea of metroidvania style of maps and item acquisition and mashes it up with more high action platformers such as Dust, or Cave Story. To break the game down simply, you go from stage to stage, searching through the map for new items and skills in order to advance through, until you reach the end boss. Along your journey you have a variety of ways to defend yourself against the game's varied amount of enemies and traps. You have a basic forward attack, an upward swing, and the ever useful, aerial somersault. Each attack will have it's own advantages and disadvantages, for example, the normal attack does a ton of damage but have limited reach and utility. While the aerial somersault is incredibly useful for comboing, protecting yourself from oncoming projectiles, and for control of a given combat scenario, however, it's weaker than your basic attack. You also have a quick dodge / dash that you can use for both maneuverability, as well as bypassing incoming projectiles. Along your travels you'll also come across items of varying degree. Some items will give you passive buffs, while others are active, and can be used to heal, buff, and some are even usable weapons. As you continue through the game you'll find many more skills, items, and weapons. This is essentially the core of what makes up Pharaoh Rebirth. 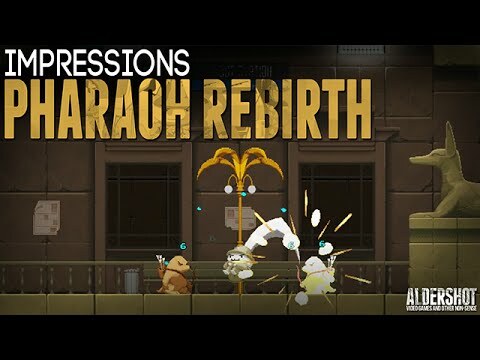 Pharaoh Rebirth's visuals are well illustrated and animated. The frames are smooth, and the pixel art professional looking. The overall design is rather cutesy, but not so overbearingly so, that you'll be ashamed to play it in public. It's overall aesthetic quality is great, but it is mired by technical limitations. There is no native resolution, no 1080p, or even simply a wide screen mode. If you set the game to "full screen" on the pre-launch menu, you'll be greeted with stretched pixels, and distorted images. Even when set to Windowed mode, the game will launch as a tiny 640 X 640 square, where you'll have to manually stretch the game, doing your best not to stretch the pixels out side of it's originally designed resolution. To say the least, this is not optimal. The game itself is a very enjoyable romp, that offers a fair challenge to the player, while maintaining a very accessible set of mechanics that most could quickly understand within just a few minutes of play. Though it's simple at first, you'll find yourself dying more than once as you progress. Enemies take off large chunks of life, and there is no health regen except very specifically located check points. Trial and error will be your best teacher. As you would expect from a metroidvania style of game you'll be fighting bad guys, and exploring the map which seems like a fine endeavor, however, there doesn't seem to be any real map makers, compass, minimap, or even... a map at all. The player will be forced to rely on memory, or in my case, pure attrition to make it out of any given stage. Overall Pharaoh Rebirth is a satisfying, and enjoyable action platformer with some metroidvania style mechanics for good measure. The combat and map design are enjoyable, creative, and just deep enough to keep players entertained, however, what is an otherwise very enjoyable game is mired by technical limitations with it's resolution, and player conveniences such as a map.